Lisa Stublic was our guest on Episode 20. C259: Lisa, welcome to Cloud259. Lisa: Yeah, when I moved to Croatia, it wasn’t such a big decision like many people would think. It was kind of just a whim. I was kind of lost in my life and my whole dad’s side of my family lives here. At the time I didn’t know how to speak Croatian so at the time I just figured I would come and learn Croatian and see where my life would lead me. I thought I would stay here for a year or two, I didn’t think anything so special would come out of it. C259: Did you stop running competitively for a time when you moved or did you keep at it? Lisa: I was always running. Even after college I ran for NYAC but it wasn’t anything so serious. Then when I came to Croatia, I was running at the same level I was running after college. I trained myself basically. The system in Croatia is different than in the U.S. I wanted to run a steeple race, and you can’t run as an individual in Croatia you have to be part of a club or you are not allowed to compete. So I signed up for a club, and then when you’re a member of a club you automatically get a coach, so that started the whole process. C259: So then what made you dedicate yourself full time to being an elite? Was there a race in particular that opened your eyes to the possibility? Was it a more gradual thing? Lisa: It was kind of gradual. I started training with the coach I have now at the end of 2008. When I started training with him he always told me from the beginning that, with how I run, that I would be a great marathon runner. But I didn’t really believe him — I thought the marathon was an impossible thing, so I didn’t really want to train for it. And then in 2009, my coach and I made an agreement. He said that if I ran a standard for World Championships in the steeple (at the time I was running the steeplechase), he would never mention the marathon again. If I didn’t, I would run at least one marathon in 2010. Needless to say, I didn’t run the standard in the steeplechase, so most of 2010 I just spent increasing my mileage and marathon training, and then I ran the Berlin Marathon in 2010. When I came to Croatia, I started working as an English teacher. So a month before the Berlin Marathon I ended up quitting my job, because I thought that I could run the standard. If you have the Olympic standard, you get a stipend from the Croatian Olympic Committee, so you can live off of that. Before I quit my job I was working as an teacher and running at the same time, so it wasn’t so serious. C259: Do you look back at the steeple, and are you thankful now that you didn’t make the standard? Lisa: Yeah, I really liked the steeple, for me it was really fun, but I was horrible and had really bad form. I’ve had much more success in the marathon. Plus, marathon training is lot easier for me than steeplechase training was, even though that doesn’t really sound like it makes sense. C259: That’s so interesting. I can’t imagine that many marathoners come from the steeplechase, but you’ve definitely moved in the right direction as far as your talent and your enthusiasm, actually. I’m sure at first the thought of running a marathon wasn’t appealing, but you’ve come to enjoy the training, I imagine? Lisa: When you hear marathon, it just seems so long. The first thing that came into my mind was “Why would you ever want to run so far?” But then as I did the training it wasn’t really so hard for me, it was just long. The training felt more like mental training than physical training. You still do hard workouts, but doing workouts more based on endurance is easier for me personally than doing really fast workouts. C259: We’ll come back to your training later on, but we want to continue the timeline: You first came on our radar in a big way at the NYC half nearly a year ago, when you finished third in 1:09, a great time, but you were also briefly leading and had dropped the talented Kenyan Caroline Rotich. Do you consider that your biggest breakthrough race? Lisa: Yeah, definitely. When I came into that race, my coach and I thought that I was in shape to run 1:09:30. So I had confidence that I could run around the time that I ran, but nobody else knew. My PR before the race was 1:10:30 something. Towards the end of the race, I knew I really didn’t have a finish. I’m really good with endurance type things but I knew I couldn’t outsprint either Caroline or Diane [Nakuri Johnson] so I was trying to make a little gap before the finish but unfortunately I didn’t succeed. C259: Two weeks later came your 2:25 at Zurich, a 5-minute PR in the marathon. What’s your most vivid memory from that race? Lisa: It was really cold at that race, is what I remember the most. The race kind of seemed like a blur. The last 6K was really hard for me. From the beginning until 6K from the end, it didn’t really seem so hard compared to all the other marathons I’ve run. Then all of a sudden, about 6K to the end, my legs cramped up and it was a fight to the finish. C259: Were you aware of how fast you were running, perhaps how ahead of what you had anticipated? I mean 2:25, that’s rockin’. Lisa: My coach and I we had plans to run around this time. He was at specific points in the course telling me if I was on pace. We were planning to run between 2:25:30 and 2:26:00, so I wasn’t really surprised by the pace because that was the original plan. C259: How did your preparations for the NYC Marathon compare? At New York you were well of your PR at 2:34, but it was a tough day out there with the wind, and it’s a tough course. 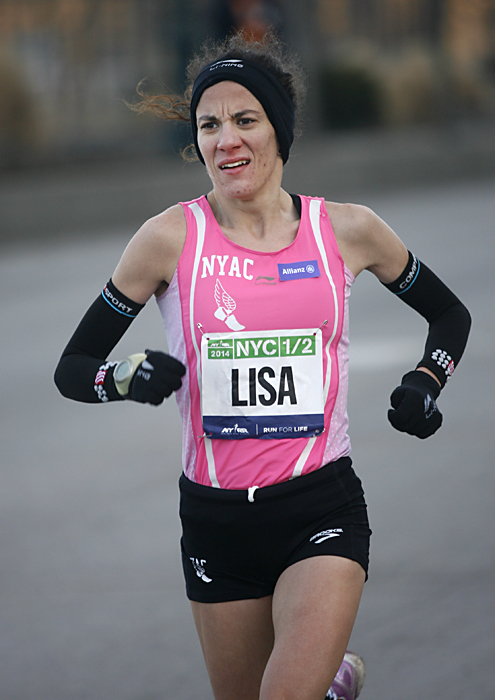 Lisa: I think for the New York Marathon I made the mistake of not running my own race. I think my biggest strength at long distance racing is that I am really good at keeping a tempo. I have really good endurance but I don’t really have speed. I’m not good at changing tempos back and forth. When the race started that slow, I think I would have been better if I had started out at my own tempo from the beginning and not pay attention to the group. I stayed with the group I think until 25K, but then all of a sudden it picked up, and it wasn’t that hard for me, but I’m not used to making changes. It was too late in the race to make a change and just kept running the same tempo I ran most of the race. C259: Was your buildup to the race similar quality as your buildup to Zurich? Lisa: Basically it was the same, but before Zurich it was perfect preparation, nothing went wrong. Before New York there were always little things happening, every once in a while. I was doing some training better than I would expect, and then a week later some little thing would happen, and then the training would be a little slower than I thought I would do. It wasn’t as consistent as before Zurich, quality-wise. C259: I imagine you must be eager to get past that New York time and get back closer to your PR or even top your PR, so what are your plans for 2014 for the marathon and also the half marathon? Lisa: For 2014, I decided not to run a marathon in the spring. So I’m going to run the New York City Half Marathon again, two weeks after that I’ll run World Championships in the half marathon, then I’ll probably run a 10K on the track, and then I’ll go right into marathon training and I’ll run on Aug. 16 the European Championships in the marathon. I always feel better when I run a marathon when the season before I didn’t run a marathon. Because of that I decided not to run a marathon in the spring. C259: Just remind us where the European Championships marathon will be? Will it be a hot race potentially. Lisa: It’s going to be in Zurich. C259: That’s a good place for you. Lisa: Yeah! That’s why I ran Zurich last year. But the course is a little different this year. I don’t think it will be very very hot. I think it will be a temperature that’s not so bad for running a marathon. C259: Who do you anticipate being your top competition there? Lisa: I’d say one of the favorites coming in would be Valeria Straneo from Italy. She came in second in the World Championships last year, and I think she was eighth in New York. I think she’ll be favorite coming in. Also Jelena Prokopcuka, who was third in New York. If she runs, she’ll probably be a favorite as well. C259: Yeah, and she won New York several times, right? Lisa: I think she won in 2007 or 2006, I’m not exactly sure. C259: Well that’s great we’ll be looking forward to seeing you in New York again, on March 16 at the New York City Half, and you’ll definitely get a lot more attention at the start than you did prior to last year. C259: So we like to touch on the business side of the sport occasionally. You pointed out to us that in the United States, runners with great marathon potential can get overlooked coming out of college. Can you tell us more about that? Lisa: Yeah, running a marathon you can come to it from two angles. You can be really fast at the 10K and 5K and gradually work your way up to the marathon. But then I think also you don’t necessarily have to have such good track times to run a good marathon from, if you have really good endurance. I think I fall into that category. But that’s something really hard to see. People like me, when I was in college I ran OK, nothing so stellar, so no one would think I could become anything in the running world. So it’s real hard to keep on running after college, there’s not so much support for you, you have to do it all on your own. There’s no program to develop marathon runners per se, unless you already have accolades to your name. There a couple of programs, but I think it is a lot harder. At the same time, it’s hard to make a program because you can’t really measure potential. I don’t know how you would make such a program. C259: It’s a great point, and there’s no easy fix. But when we think about some of the runners we’ve interviewed Dot McMahon and Jeannette Faber were not superstars in college, they would admit that. Even Desiree Davila was kind of under the radar in college, and they persevered and found training groups and maybe relied on others in their lives to get through those three or four years to become top talents. The implication is, there’s probably a lot of talent that never gets a chance to develop. C259: And just to add, we don’t have half-marathon or marathon championships in college. And those races are so different, especially a marathon, is so different from a track race. Lisa: And plus in college when you are 18 or 19, it’s a little young to start running half marathons or marathons, I think. C259: That’s exactly right. Now Lisa, you have many interests outside of running, music, poetry, drawing, we even read somewhere that because you are such a coffee lover, you wanted to compete at the world Barista championships — we looked that up and it does exist. Lisa: Yeah, it was one of my college dreams. C259: Do you expect to keep running marathons for a long time, or will you go in a different direction. What are the biggest goals that keep you in marathoning right now? Lisa: My biggest goal is I want to see how far I can go. I don’t think I’ve reached my potential yet. If I were to run a marathon and I felt that was the peak for me, I would probably start transitioning into something else. I think I’ll always run my whole life, but how serious I will approach my training would all be dependent on if I thought I’d reached my potential or not. But when I stop running so serious, I would probably want to do something more artistic. C259: Is Rio a big focus for you? Lisa: Of course it’s a focus but I like to take it year by year, so right now I’m focusing more on European Championships than Rio. C259: Can you touch on your Olympics experience in London in 2012. Beyond the race itself, what was the atmosphere like? What is it like to compete at the Olympics? Lisa: It was crazy, the whole time it felt like a dream, it didn’t seem like it was real. I went into the athlete warmup area and every country had their own tent, and you’d see all the best marathoners in the world, warming up right next to you. Right next to me on the starting line, everyone together, it didn’t seem real. The first 10K of the race I wasn’t so focused on the race, it was so loud you couldn’t even hear yourself think and you’re surrounded by great runners. It was so surreal I have no words to describe it. C259: Did you stay in the athlete village for a while? Lisa: I actually wasn’t there for so long I came two days before my race and I left a day or two after. I didn’t really experience the village so much, because when I arrived, I didn’t do anything I just kind of rested. And then after the race you can’t really walk, I was just limping around. C259: So we wanted to talk about your training approach. You’ve said that you probably train a lot slower than most people at your level. So we’re curious about that and your general philosophy and also how often you do crank it up for speed. Lisa: We have this whole method of training that’s based on how much lactic acid is in your body. We do these tests every month — so it will tell you what your zones are. For example, zone 1 is the easiest and zone 1 is the hardest. Basically, with this type of training you know how tired your body is at every given moment. We’ll take these measurements when we’re doing harder training, so you know if you can go faster, or slower, or stay the same. C259: The test is a blood test, is that right? Lisa: Yeah you take sample from your ear and you put it into this little machine. It’s kind of like when you go the doctor and they prick your finger. It’s the same concept, but we do it on the ear, because your finger gets sweaty and water gets mixed in. C259: Do you have any alternatives for people who are afraid of needles, like Brenn? Lisa: I guess you can always guess what your zones are, because it pretty much correlates with your heart rate. Not every one is exactly the same, but on the average, the first zone is about 130 beats per minutes. C259: So if you have a lot of lactic acid in your blood, you dial it down? Exactly how does it work? Lisa: You get the measurements, and if it’s too high you either take a longer rest, or you slow down a little bit. It all depends on what type of training your doing. If you’re doing intervals you would just take a longer rest, if you’re doing some type of steady state you would slow down for a little bit. C259: How many miles a week do you get in during peak marathon training? C259: You can tell us in Ks, we’ll convert. Lisa: Normally when I’m in my base training I run about 190 to 200 Ks a week. But when I’m in my peak training, I’ll run about 170 to 180 Ks a week. I always do everything in cycles, so I’ll have three weeks normal training and then one week easy. The easy week will be like 80K to 100K, just for rest I guess. C259: So basically it’s anywhere from 60 to 120 miles a week. And about your long runs — we have runners with different philosophies on long runs, some add in marathon pace work, some go over 26.2 miles — what do your long runs look like? Lisa: For me on long runs it’s all dependent on where I am in my preparation. When I’m more in base training I’ll just do very very easy long runs at 130 heart rate. And everything is on time so my first long run will be 3 hours, and the second week will be 3:15 and the third week will be 3:30. The fourth week I won’t have a long run because it will be rest. I do these type of long runs for 2-3 months, depending how many months my preparation will be. As I get closer to the marathon, I’ll stop doing these really slow long runs, and I’ll start doing crescendo-type runs. I’ll start off at about 8 minutes per [mile], and every mile or so I get gradually faster and faster until I run a little bit faster than marathon pace. I’ll just go up through all the zones, so for example I’ll have a half hour at zone 1, a half hour at zone 2, a half hour at zone 3, 20 minutes zone 4, 10 minutes on 5, and then 15 minutes zone 1 for a cool down. C259: It sounds like a very scientific approach to training. I don’t know if your familiar with Dr. Jack Daniels, but he’s written some books and it sounds like some of the zone work is reminiscent of his training plans. Lisa: It is really scientific. I feel like it’s hard to make mistakes with this type of training. C259: We read the following quote from your coach at Columbia, Craig Lake, and we’re interested in your reaction. He’s talking about the importance of eating well and getting to bed early. He says “I used to tell the students, the dorkier they could be, the better. Lisa seemed to listen. It’s a hard concept to grasp because most people see it as a sacrifice.” So how dorky are you Lisa? Lisa: [Laughs] I wasn’t so dorky in college, so I think my coach thought I was more focused than I really was, maybe. But now since I started running better I would say I’m pretty dorky. All I do is eat, sleep, and run, pretty much. C259: Our last question, it’s a bit of a selfish question, we’re looking for a marathon tip for ourselves. The name of our show is about our goal to get under 3 hours, to get a 2:59, and Brenn’s already done it. But know we’re looking ahead to both get PRs in the marathon. So besides being a dork, what training tip would recommend for us to get a PR? Lisa: I would say that when you’re training, faster does not always necessarily mean better. Sometimes it’s better to take it a little easier one day then to force something, if you’re tired or sick for example. C259: I like it. The marathon requires patience. It sounds like your training approach involves a lot of patience, doing three-and-a-half-hour runs at a certain heart rate before you start cranking it up closer to the race. From my experience anyway, with the marathon, if you do more of that kind of training, you run faster. Lisa: Yeah, the marathon is really long, it’s a test of endurance. So if you want to have a fast time, you have to obviously have some speed. But if you don’t have the endurance to support that speed, then you’re doomed from the beginning. So I would say that endurance is the main focus. C259: Terrific, well thanks for that and thanks for telling your story. We’ll be following you, we’re very happy to hear that you’ll be back on the streets of New York and we’ll cheer you on. So Lisa, good luck and thanks very much.